Cattle, colloquially referred to as cows (though technically cow refers only to female bovines), are domesticated ungulates, a member of the subfamily Bovinae of the family Bovidae. They are s livestock for meat (called beef and veal), dairy products (milk), leather and as draught animals (pulling carts, plows and the like). In some countries, such as India, they are honored in religious ceremonies and revered. 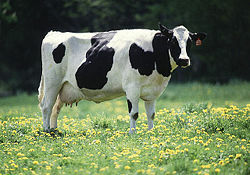 It is estimated that there are 1.3 billion head of cattle in the world today.